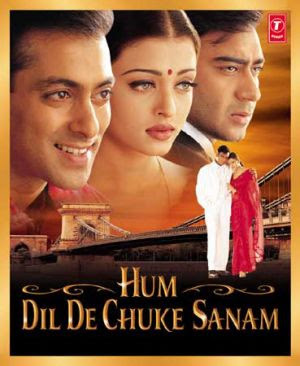 Hello Friends, I am sharing some beautiful romantic dialogues of Hum Dil De Chuke Sanam Movie. The movie was released in 1999 staring Salman Khan. Ajay Devgn & Aishwarya Rai. This movie is diarcted by Sanjay Leela Bhansali and produced by Sanjay Leela Bhansali. This is very romantic drama film. It is a love triangle film between three people. Some beautiful dialogues are delivered in movie. I have collected some romantic dialogues of this movie Hum Dil De Chuke Sanam. "Bhangi nakhu, todi nakhu, bhukko kari nakhu"
"Jhoota gale se gaata hai, bhooka pet se gaata hai ... lekin sachcha dil se gaata hai"
"Beti toh hoti hi hai patang ki tarah ... shaadi ke pehle apne chatt par udhti hai ... aur shaadi ke baad dor kisi aur ke haath mein"